And, driving home the point, Israeli jets bombed runways at two major Lebanese army air bases near the Syrian border, the first strikes on the Lebanese army in Israel's fight with Hezbollah guerrillas. Maj. Gen. Udi Adam, the chief of Israel's northern command, said Israeli jets had hit hundreds of targets in Lebanon since Wednesday night, and the army has not ruled out ground operations in Lebanon. Israel has information that Lebanese guerrillas who captured two Israeli soldiers are trying to transfer them to Iran, Foreign Ministry spokesman Mark Regev said Thursday. Hezbollah guerrillas continued firing rockets into Israel cities into the evening, including the major port city of Haifa. There were no injuries in Haifa, but that was the farthest south that rockets fired from Lebanon had hit, police said. The rockets hit an immigrants' absorption center and a college. Another fell near a gas station. Safed had not been targeted by rockets since the 1990s. A town of 20,000, it is about 10 miles south of the Lebanese border. 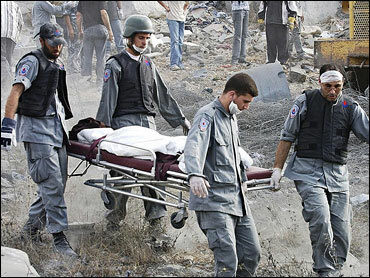 Earlier, a rocket killed an Israeli woman in the border town of Nahariya. Israeli warplanes blasted craters into all three runways at the airport, located by the seaside in the Lebanese capital's Hezbollah-controlled southern suburbs, forcing incoming flights to divert to Cyprus. The main terminal of the $500 million airport remained intact. "The conflict in the region is sure to be added to the G8 summit agenda," says CBS News foreign affairs analyst Pamela Falk. Regev said the offensive in Lebanon has far-reaching objectives, including pushing Hezbollah militants away from the Israeli border and eventually sidelining the group altogether.